Whether you just started your business or you have an established company, you might be asking yourself whether or not you should be on one or all of the following social media platforms. Perhaps your business partner is telling you to create a Facebook profile, Pinterest board, Snapchat filter, and every other social platform that is available, maybe even Vimeo. Instead of biting off more than you can chew, you have to take a step back and consider which social platform is best for your business and will help accomplish your goals and reach your target audience. Since social platforms are free, it is tempting to think that it is another complementary marketing outlet that will allow you to contact more of your target audience; however, many implications come with that decision. Before building a social media strategy, you need to know what your primary business objective is on social media (i.e., drive traffic to your website, increase followers, build brand awareness). Once you understand your business objectives, you can utilize the following five tips on how to pick which social media platform is best for your business. 1. Understand the purpose of each social platform. Before you start opening an account on every social platform, it is essential to understand what each platform does. If your target audience is millennials, being on Instagram and Snapchat may seem like the right decision. You might be right, but it is essential to understand your audience’s behavior and how they will discover your brand and business on social. Facebook’s mission is to “Give people the power to build community and bring the world closer together.” If you are a local business, Facebook is a great platform that allows you to interact with your local community and build awareness around your brand. 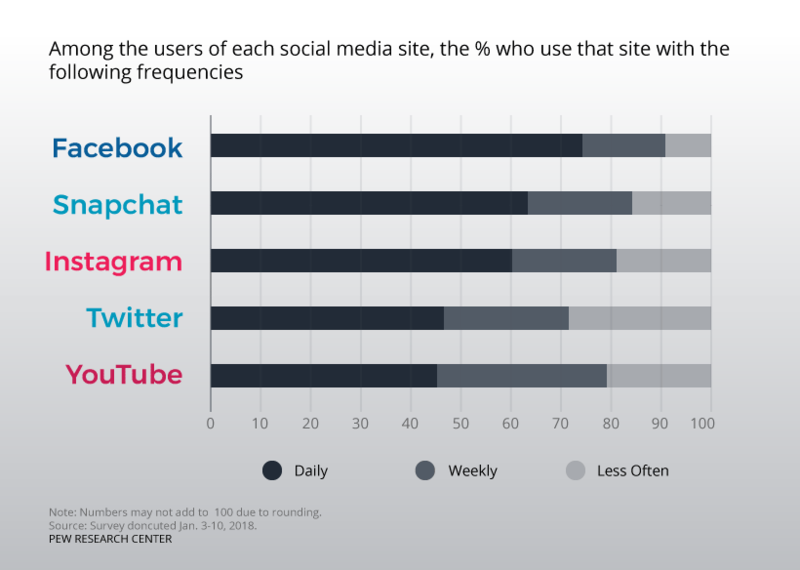 Additionally, according to Pew Research, Facebook is the most widely used social platform. Instagram is visual; YouTube is video-based; Facebook is community-building; Yelp is reviews of restaurants; and Pinterest is visual inspiration. Once you understand the purpose of each social platform, it will allow you to narrow down which platform will be best for your business. The next component of understanding the meaning of each platform is user usage. 2. The numbers don’t lie. In addition to understanding the purpose of each social platform, knowing the user’s performance will put you ahead of the game. You want to be where your followers are. Take a look at your current website traffic. If the majority of them are females that gravitate to the visuals on each landing page, then Instagram, Facebook, and Pinterest are great platforms for your business. If you are an electronics company, users will rely on videos to understand how to use your machinery. YouTube how-to videos might make great, digestible content that users will find relevant. 3. Where are your competitors? What is your industry’s competitive landscape? Is there a particular social influencer or brand that stands out to you? Who’s following them? Whom are they supporting? When searching for a social media expert, you need to make sure that they do a thorough competitive analysis to answer all of those questions. The report will help gauge where your competitors are and which platform would be best for your business based on industry. Understanding your competitive landscape will assist you in building a strategy for targeting influencers, brand ambassadors, and audience to purchase your product and remember your brand on social. 4. Consistency is key to being memorable. You have received your competitive analysis report, checked the numbers, and you have picked the social media platforms that are best for your business. Before you immediately start creating your accounts, make sure that your content is consistent and the handle you claim is the same across all channels. A handle is your social username. It’s confusing for your audience and followers if your social handles are all different, so make sure that they are consistent across all platforms. Next, make sure you have a business logo image that you can upload as your profile image across all platforms (Remember, consistency is so important! ), especially if you want people to remember who you are. When uploading a profile and header image, make sure the photos are the right social dimensions. You would not want a potential user to come to your Facebook page and see a pixelated header image. 5. Do not push the same content on all platforms. One of the biggest no-no’s in social media marketing is cross-posting, which is pushing the same content on all of your platforms. It looks redundant and lazy. The challenge with this is that it requires much time and planning to establish which content should go on which platform, but that leads me back to tip #1. Each platform can be utilized differently. Make sure that your social media expert walks you through platforms, scheduling frequency, and content strategy that will be best for meeting your business objectives. Remember, more is not always better. You want to be thoughtful and strategic when choosing which social platform is best for your business. Your customers and followers are coming to you to find relevant and unique content. By understanding and implementing the five tips above, you can optimize your social marketing strategy and find platforms that complement and support your business objectives. There’s no free lunch. And in this scenario the social platforms are free, but your time and business goals are not. When you are strategic and thoughtful about your content on each platform, you will reap the benefits of better engagement and more loyal followers. Quality outweighs quantity, especially on social. Sing Weist has over 8 years of social media marketing, digital media, and brand development experience. Skilled in measuring and analyzing ROI, and content calendar management across multiple social media platforms for B2B, entertainment, non-profit, education, hospitality, and healthcare companies. She loves being on the cutting edge of social and digital media, as well as traveling, running, surfing, spending time with family, and indulging in: cinnamon rolls, donuts, ice cream, and lots of sweet treats.